Architecture is the most visible and public of the arts. An important function of the Regional Institutes (for Architecture) and the South African Institute of Architects (SAIA) is to recognise and promote excellence in architecture and to create public awareness and debate on architectural issues. The awards programme is run in two stages over a two year period, starting with Regional (Merit) Awards during the first year. The recipients are considered for the national SAIA Awards for Excellence in the second year. These awards are conferred upon the projects and not the authors or clients, and as such we want to share the honour with all those who contributed to the success of these projects, including our clients and their representatives, co-consultants, sub-consultants, contractors, sub-contractors and users of the facilities. Thank you very much! For those who are interested, an exhibition of the 65 projects entered is currently on display at the Cape Institute for Architecture, 71 Hout Street, Cape Town. It is a very humbling experience to visit these projects and to see how well the users are caring for the facilities and how well the public interacts with the buildings. It is a great honour to be recognised by our piers for contributions to our built environment. 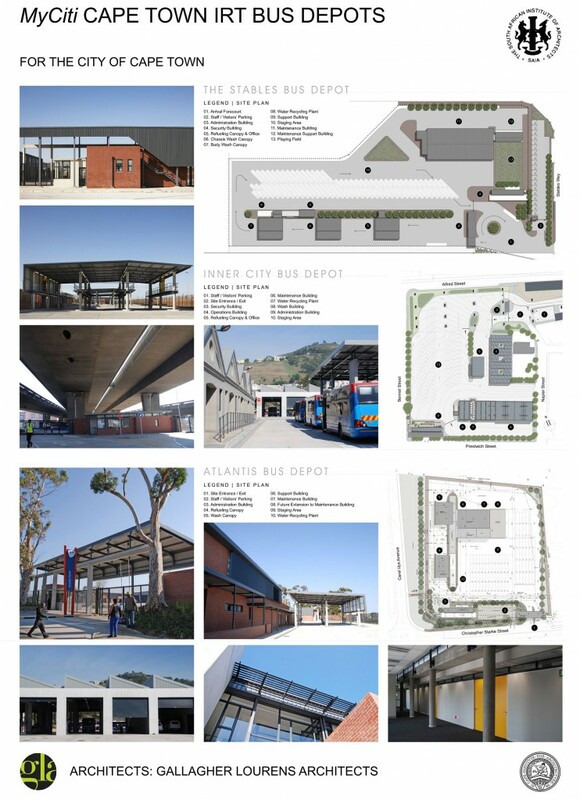 MyCiti Cape Town IRT Bus Depots is another of the Gallagher Lourens’ Projects to be awarded by the Cape Institute of Architecture in September. These three newly built depots for the MyCiti bus system, surpass their modest utilitarian function through their elegant architectural handling and sensitive urban siting. Designed by Gallagher Lourens Architects, the buildings sit comfortably within their respective urban and suburban contexts, and create a high standard for a new culture of ‘public works’. 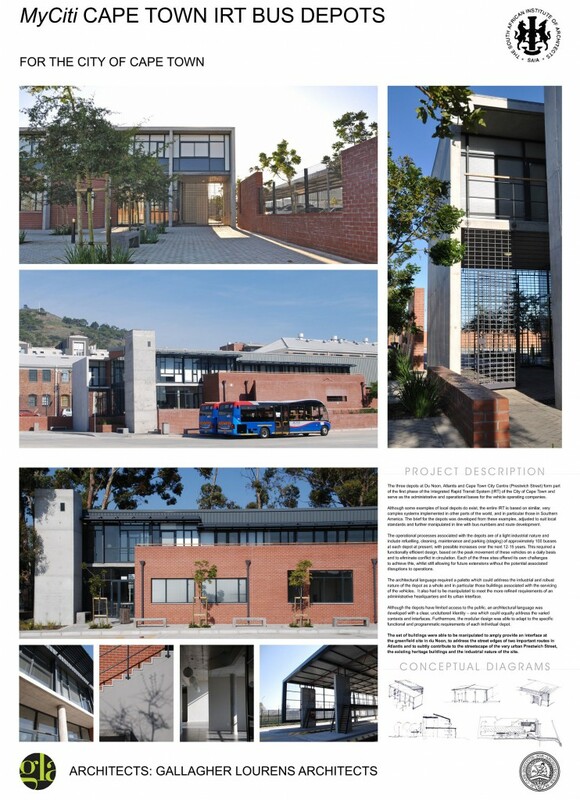 At the start of the project, the architects assisted the client, the City of Cape Town, in putting together a workable brief based on global best practices to best accommodate the users’ needs. This necessitated a range of buildings including offices for the admin staff, recreational amenities for bus drivers, and large-scale industrial spaces for the washing, parking, maintenance and repair of the busses. The depots are made up of a series of prototypical generic buildings artfully arranged in different configurations on each individual site in response to the surrounding urban conditions. In Du Noon, a greenfield site, the depot abuts an informal settlement contributing a sense of urbanity to this underserviced environment. In Atlantis, the depot provides an urban edge along two important transport routes. In contrast, the Prestwich depot, is located on a brownfield site under the freeway, at the edge of the inner city. Existing heritage buildings on this site have been preserved for new use. These sit happily alongside the new contemporary clean-lined buildings. The depot makes effective use of an otherwise lost space under the motorway. In each case the siting is sensitive to its context and clear urban edges are created in keeping with the surrounding built fabric. The buildings are carefully put together using sustainable “green building” practices such as water harvesting and recycling for washing the busses. • a two storey administrative block with a reception, admin offices and social space for the bus drivers who spend long hours on site between morning and evening peaks / shifts. The working life of bus-drivers has been carefully considered in the design – either through the provision of indoor recreation spaces or through the provision of outdoor sports facilities – shared with the community. At Du Noon, the buildings are carefully arranged around a 5-a-side soccer field. • a gatehouse which cleverly mediates between scale of the city, the scale of the bus, and the scale of the people using the site. A restrained palette of low maintenance, robust materials have been used to articulate the different constituent parts of the architecture: Wall surfaces are facebrick, elegantly proportioned colonnades are off shutter concrete, roofing is expressed metal sheeting, sometimes folded vertically; light-weight posts and grilles are painted steel. This gives the projects a recognizable, clear, uncluttered identity and a crisp clean look. Natural light and ventilation has been achieved in all the working spaces, especially the admin block which benefits for clerestory windows allowing light into the passages and into the open-plan working spaces. The architects have created a high standard for an emerging public sector architecture – in some instances contributing to the urbanity of under-serviced low income neighbourhoods.